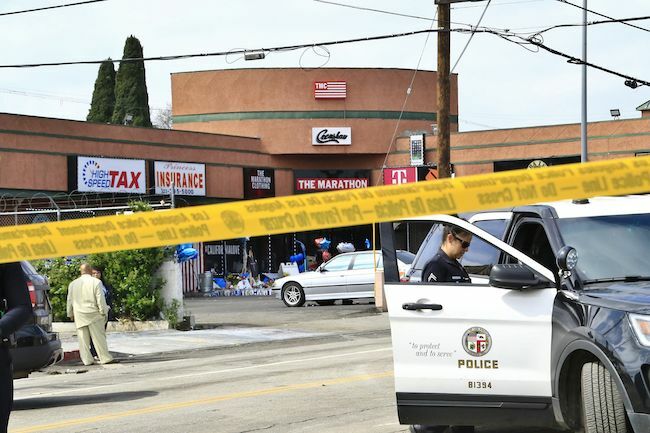 On that tragic Sunday afternoon when Nipsey Hussle was shot dead outside of his own store in South L.A., two other men with him were shot as well. One is now paralyzed - and arrested. No breaks given, it seems. After one of the three victims in the Nipsey Hussle shooting, 56-year-old now wheelchair bound Kerry Lathan, was treated and released for his gunshot wound to his back, he was arrested days later at his halfway house. Police state he was out on parole, and was barred from being around criminals or people affiliated with gangs. They claim Nipsey is still affiliated with the Rolling 60's, so Lathan was in violation of his parole. He was also left paralyzed from the shooting. Reportedly, Lathan had just recently gotten out of jail after serving a 20 year sentence for murder when he was visiting Nipsey at The Marathon Store. He and another man were outside with Nipsey - supposedly when words were exchanged with the suspect Eric Holder - when the shooter opened fire. Damn homie. To lose a friend, your bodily functions, and freedom - even if temporarily - all in a matter of a week. That's a lot. In a 2014 interview with VLADtv, Nipsey explained his decision to join the Rolling 60's after leaving his house at the age of 14. But, in recent years, and even during that interview, Nip also talked about elevating past that life and the responsibility of elevating the culture and his people using corporate moves. He saw the bigger picture and the greater place the Crenshaw area could become with his financial and human investments in his community. PREVIOUS: CONGRATS: Rapper Rich The Kid Helps Deliver His & Tori Brixx's New Baby Boy!